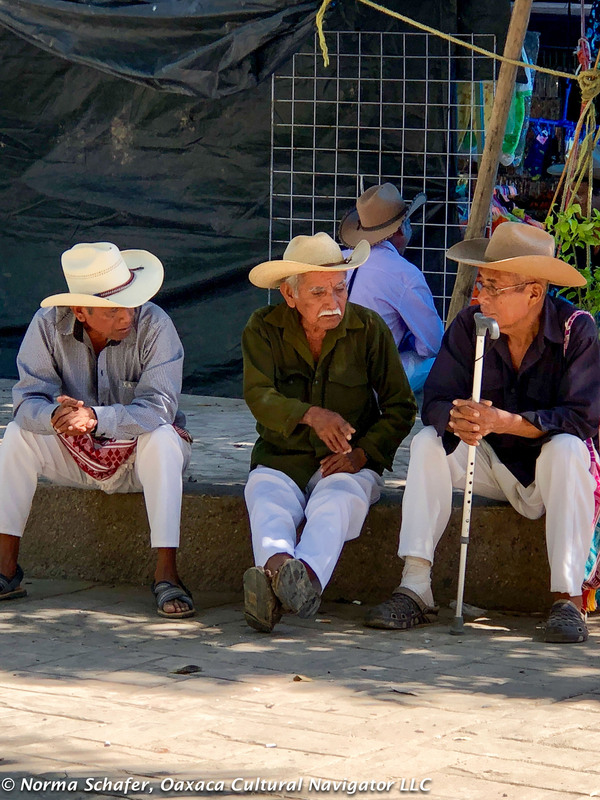 After we visited San Juan Colorado, we made a stop in nearby Pinotepa de Don Luis. 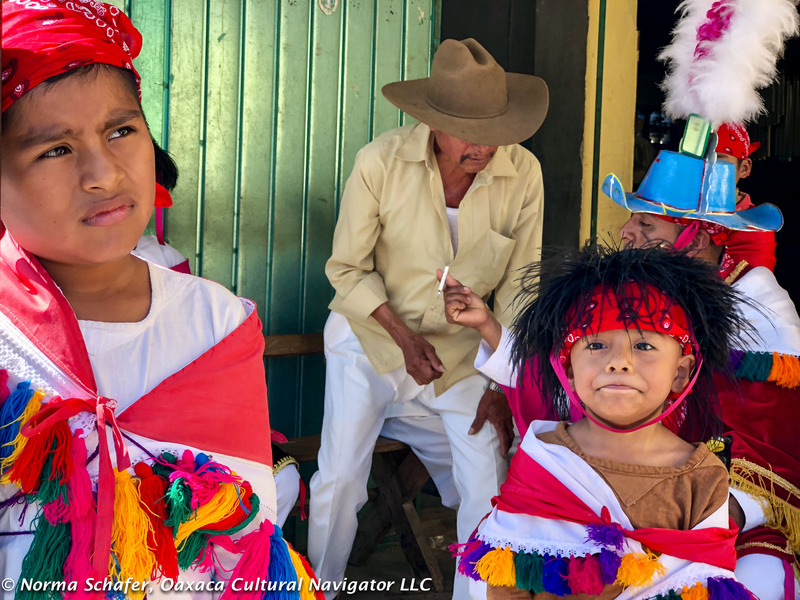 This is a village famed for its unusual striped posahuanco wrap around skirt and gorgeous huipiles. Not too long ago, because of the very hot, humid climate, the skirt and a gauzy shoulder scarf was a woman’s only covering. 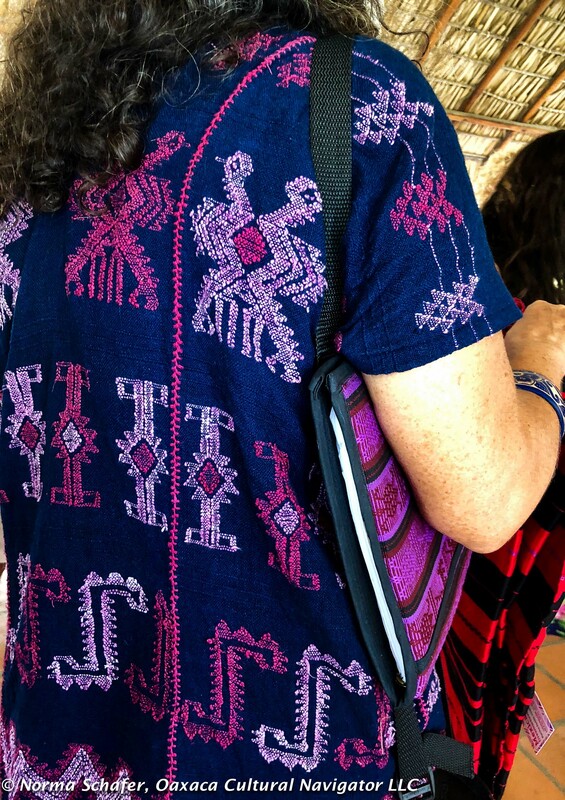 These she usually made herself on a back strap loom, beautiful and strong enough to last a lifetime. Interested in coming with me in 2019? Send an email. 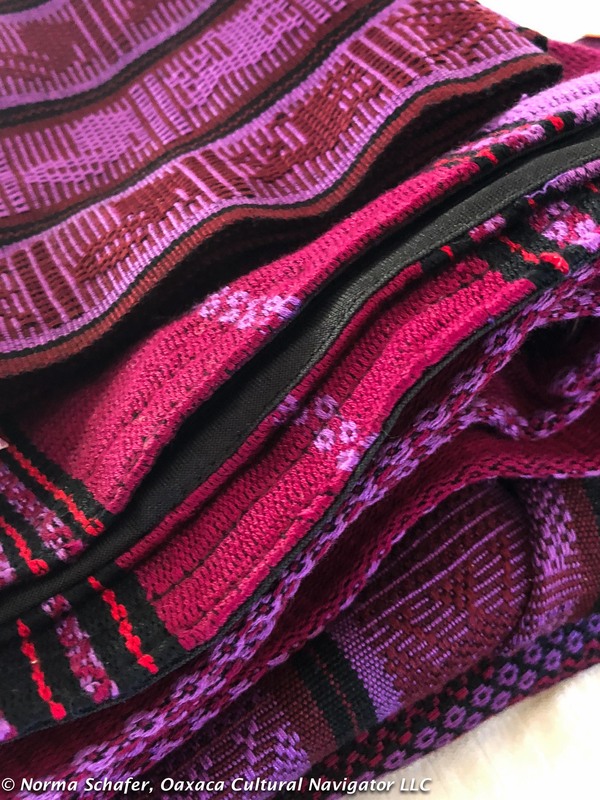 Back strap loomed cloth is distinguished by hand-spun cotton threads dyed with purple from the caracol purpura snail, cochineal red from the prickly pear cactus parasite, and the indigo plant carefully prepared in a fermentation bath. The cotton is spun using a malacate or drop spindle. The designs are not embroidered. They are created by a technique called supplementary weft, often called brocade. The threads are counted and added to the warp as the weaver creates the cloth. 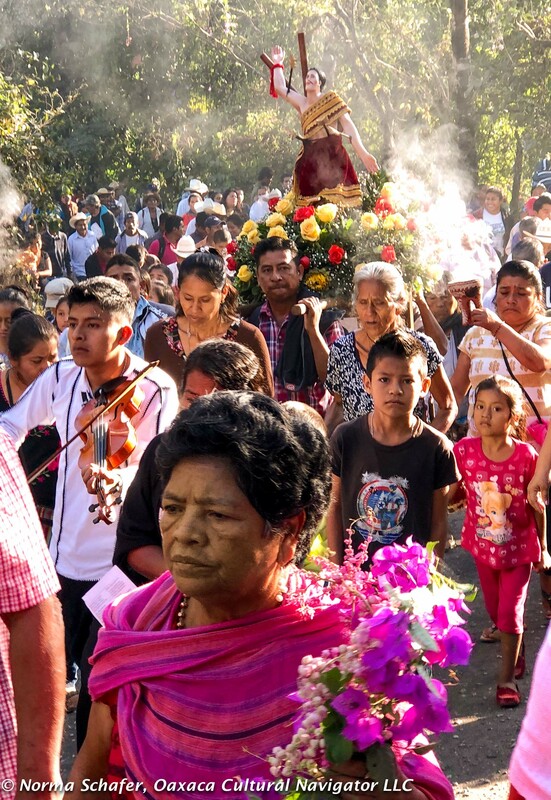 It happened to be January 20, the day of the Fiesta de San Sebastian, the martyred patron saint of Pinotepa de Don Luis. 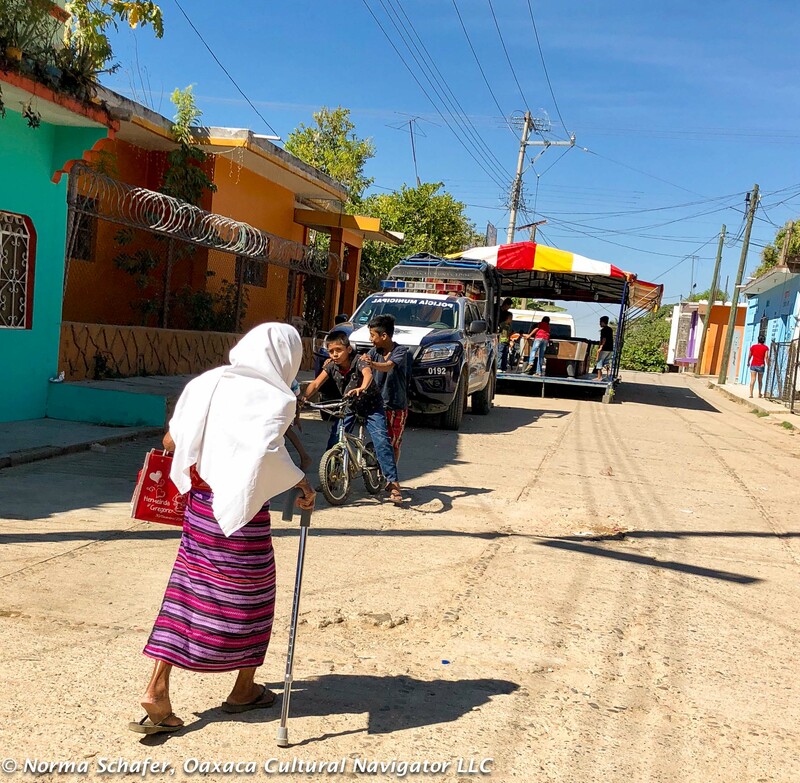 We were on our way to the Mixtec village of San Pedro Amuzgos to visit Odilon Merino Morales and the cooperative Arte Amuagos. But we had to make a stop to see the festivities! 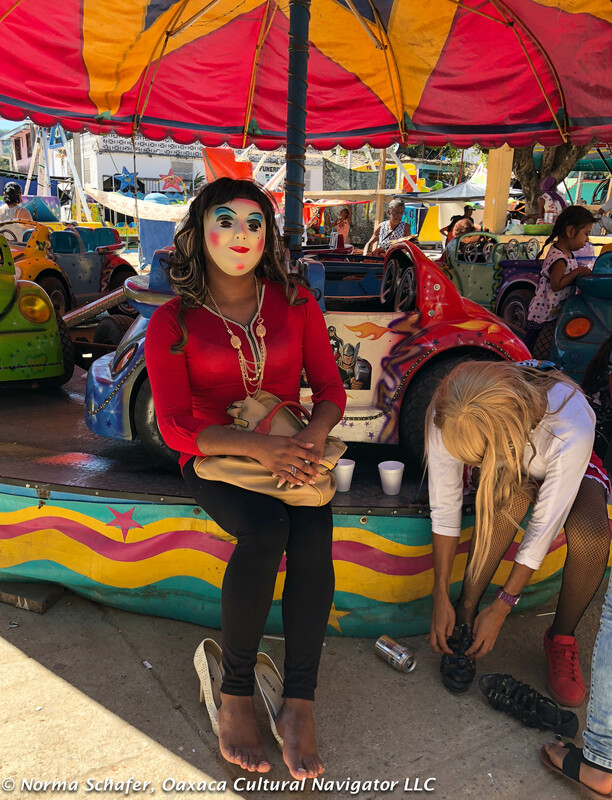 We could not pass up the pilgrimage of people carrying their saint up the hill, or the Carnival dancers in the Zocalo, or the mayordomos of the village dressed in white who sat in the patio of the municipal building sheltered from the 90 degree Fahrenheit heat. 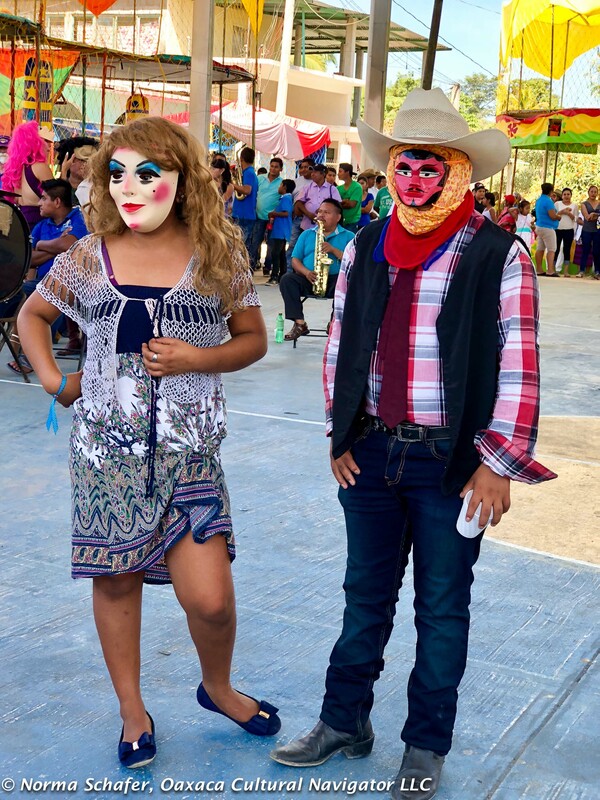 We were to return to Puerto Escondido for the annual Dreamweavers Tixinda Cooperative Expoventa early on January 21, so we decided to not visit these weavers in their Pinotepa de Don Luis homes. 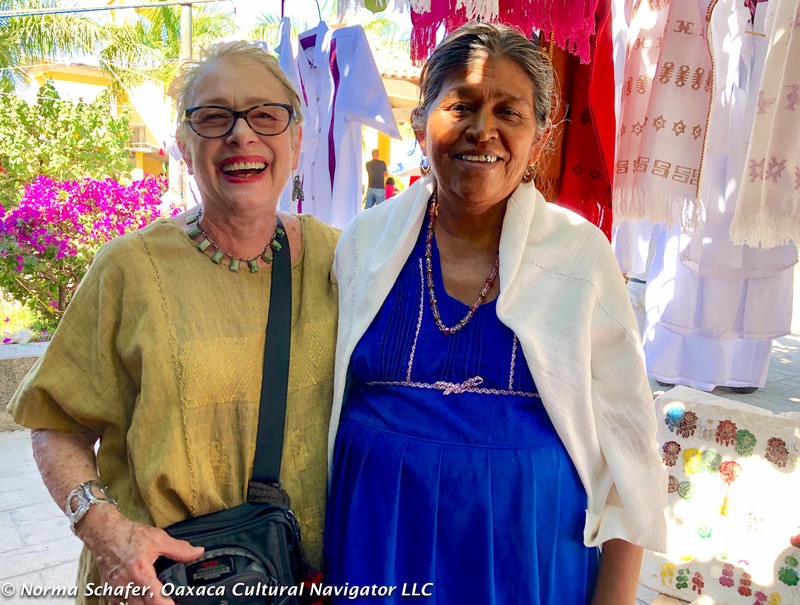 But, the fiesta drew weavers from the village who set up shop on the zocalo, where a few of us found treasures — coyuche and hand-spun cotton with natural dyes. 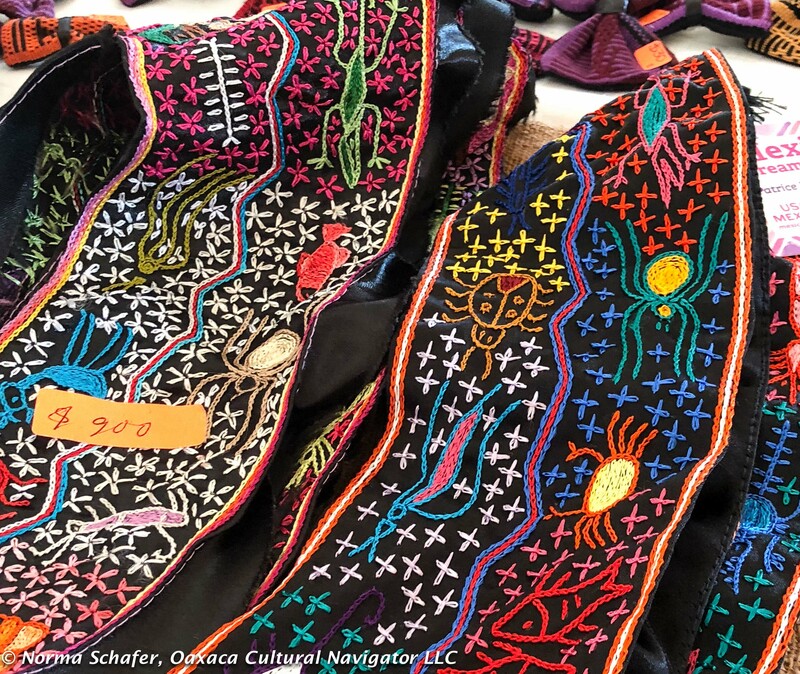 In addition to hand-woven textiles, this woman is selling earring, necklaces and bracelets made from gourds, painted and carved with sea and nature motifs, lightweight and easy to wear. Men plant the cotton, women weave. On feast days, no one works. 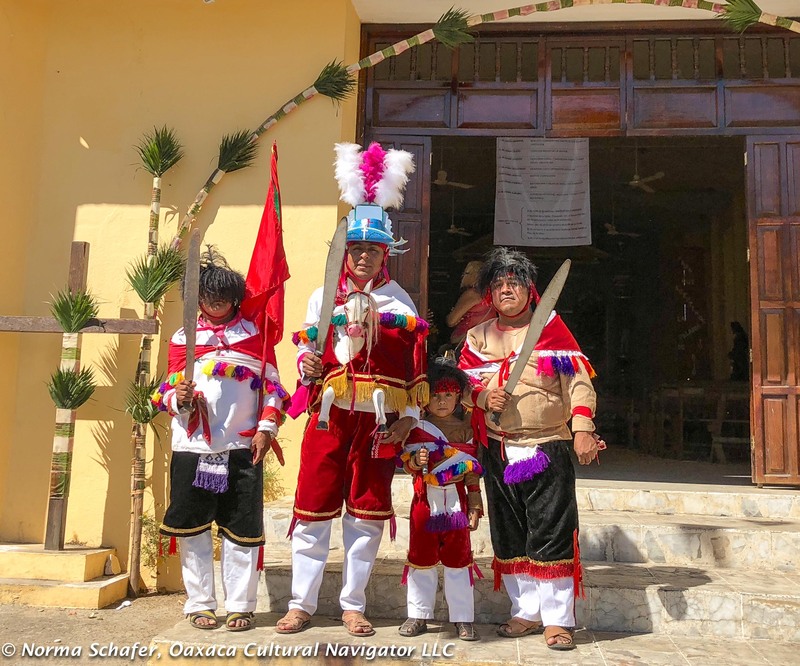 After another hour and a half on the road toward the State of Guerrero border, we were greeted by Odilon at the Arte Amuzgos cultural center he established in his home town of San Pedro Amuzgos. It was well into mid-afternoon and we sat down to a delicious lunch prepared by the women: beef soup with a rich, spicy tomato broth; comal made organic tortillas; flavorful black beans, locally raised; fruit water of fresh squeezed lime juice and hisbiscus. A good time to catch up on news. 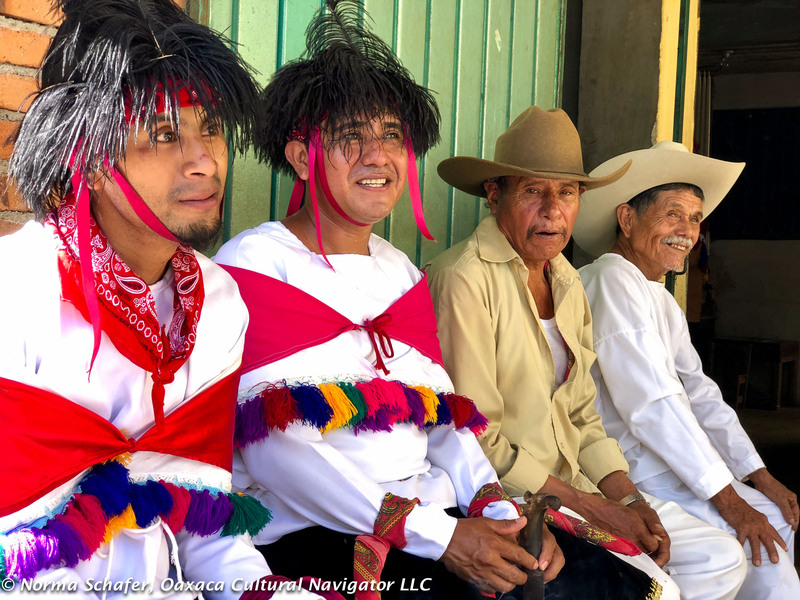 The man to the far right below is wearing a typical shirt from the region, woven with native coyuche cotton — a natural caramel color that is delicious to look at. The word origin is Nahuatl, from the Aztec language, and means coyote because the color resembles the fur of the animal.